Anya and I went to Romania to go walking and as far as that went, we knew long beforehand that a good place to do this was in Transylvania. So our plan was fairly simple: fly to the capital of Transylvania – called Cluj Napoki – look around for an outdoor shop, buy some maps and make a few plans. We had a good map of Romania, but it seemed to me, after a doing a bit of research on the net, that we needed a map of Transylvania and then also, some more detailed maps showing walking trails. Only when we were in Cluj and bought the map of Transylvania did we realise that firstly, Romania is one of the most mountainous countries in Europe and secondly, that Transylvania was a lot bigger than we thought. We were forced to scale right down; we ended buying a map of one part of Transylvania – west of Cluj – and four maps covering most of the trails in that region. Our approach to walking is to find small towns or villages in areas where there are trails and start there. Access to the trails is crucial. We avoid big towns like the plague. The worst scenario is being in a sizeable town and having to walk along busy roads or suburban streets before we can start a trip. So we usually end up in small, remote places. The problem here is usually finding accommodation and food (the eastern European diet is pretty limited). The attractive side to such places is the ‘cultural dividend’: that wonderful feeling of being a stranger in a strange place, of experiencing something very different to one’s own country. In that sense, Romania was a revelation. We walked two different kinds of trails – hills and mountains. None of our maps were in the least bit accurate. They gave us an indication of where trails in general could be found. We soon became adept at improvising: following trails with only a general idea of where we were going and often no idea where we would end up. Sometimes locals on the way gave us directions. 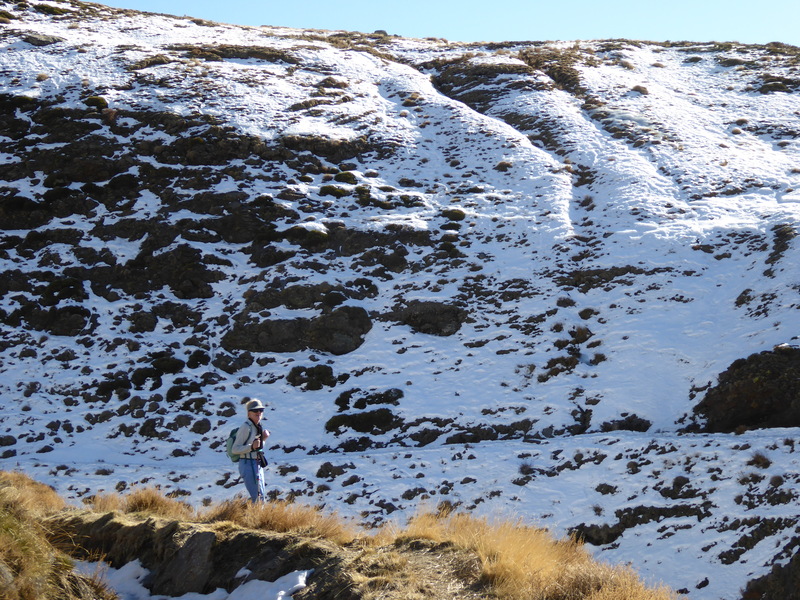 In the mountains, there were marked trails although most of the time it was very difficult to find the first markers (because they weren’t there) but once we found them – after an hour or two of taking wrong turns – they were fairly reliable. The marked trails were made for the Hungarian tourists – Romanians in general don’t walk. Whatever kind of trails we followed, the ones we liked best took us through remote villages. This was where we encountered a way of life which had disappeared from Western Europe 50 or 60 years ago; traditional wooden houses and barns, heavy work horses used to plough fields and pull carts, fences of wooden palings, old women dressed in headscarves and long colourful dresses; shepherds and cow herders. Most of the people living in these villages were old; their kids had long ago departed for one of the cities – or for Western Europe (in the last decade especially there has been a mass exodus). These old villagers knew no other way of life and they were determined to live that life until the end. It was a hard life, especially in winters when temperatures can drop far under zero, yet somehow I couldn’t see them resigning themselves to life in a typical drab communist-era apartment block in one of the cities. Not so long ago, millions of Romanians lived this way of life. Romania had lagged behind the other Eastern European communist countries. 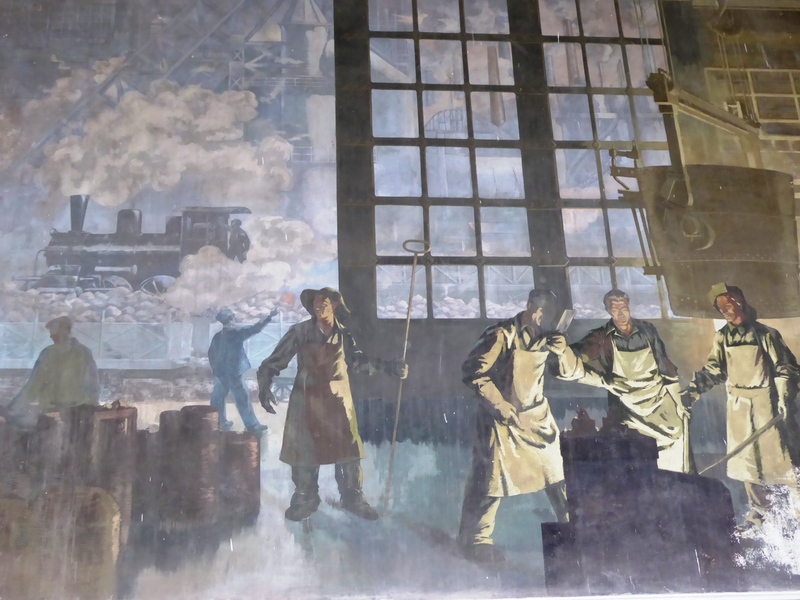 The age of Marx was a schizophrenic time for Romania: on one hand, there was a nation engaged in a Long March to the glories of industrialisation – smoke belching factories, the planned economy, free medical care and public transport, an industrial working class – and on the other hand, millions of peasants, especially in the mountains, living a way of life unchanged for centuries. 25 years on and Romania had joined the E.U. and the younger generation had left and the factories and mines had closed. A new middle class was on the rise. The western consumer revolution had arrived. 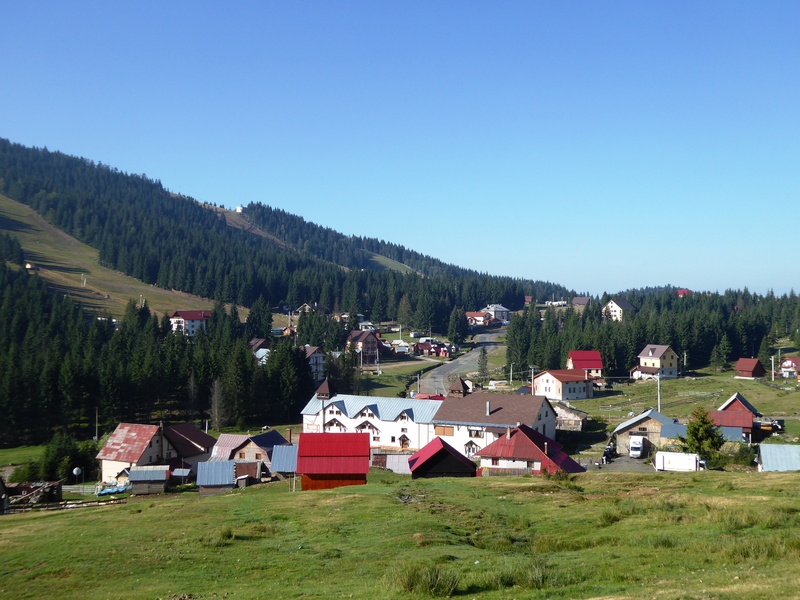 For millions of Romanians now living in the cities there was a longing for the traditional way of life of the villager; it was a kind of dream image. There were three TV channels devoted to satiating this national nostalgia for a mythical past: traditionally dressed ‘villagers’ singing and dancing and playing their instruments, with cows and horses and grassy fields and wooden houses in the background. Traditional village based music was more popular than ever before. No one of course wanted to ever actually go back to the land and relive the old life – though the middle class were buying up land and old houses and renovating them. None of this nostalgia was permitted during the communist era. The only dream image permitted was the Socialist Man. Then after 45 years of dictatorship and a failed economic model, the Socialist Man was tossed aside. To be replaced by singing and dancing peasants. Our flight back to Rotterdam left from Budapest. On the way to the Hungarian border, we left the mountains and took a bus south, passing though big towns constructed during the communist era and now very run down and dilapidated. We stayed for 3 days in a large town called Deva. Amongst other things we took a local bus out to a place called Hunedoara; there was a finely restored medieval castle near the centre but just as interesting were the remains from the communist era: abandoned factories and a huge railway siding, rusted, overgrown with weeds. 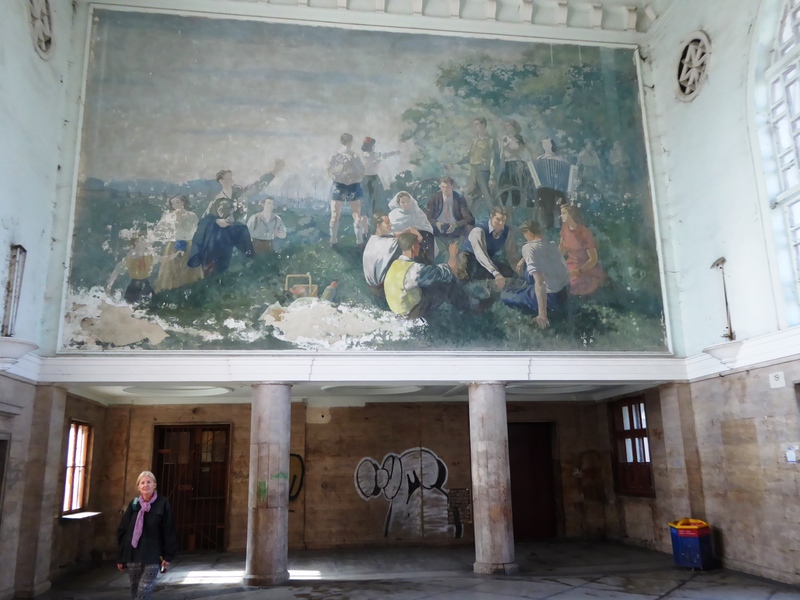 Then there was the beautiful old railway station at Hunedoara, which had been abandoned; on the walls of the main entry hall were paintings of the Communist Dream probably done about 50 years ago. They seemed valuable to me those paintings. They were a part of the nation’s history. Yet as far as Romanians were concerned, it was a part of their history which they wanted to forget. As if the Lords who had occupied the castle – on which millions had been spent – had been a part of a benevolent age. Romania was many things, it had many sides to it. We left the country resolved to come back as soon as possible; for us it was one of the most interesting countries in Europe. 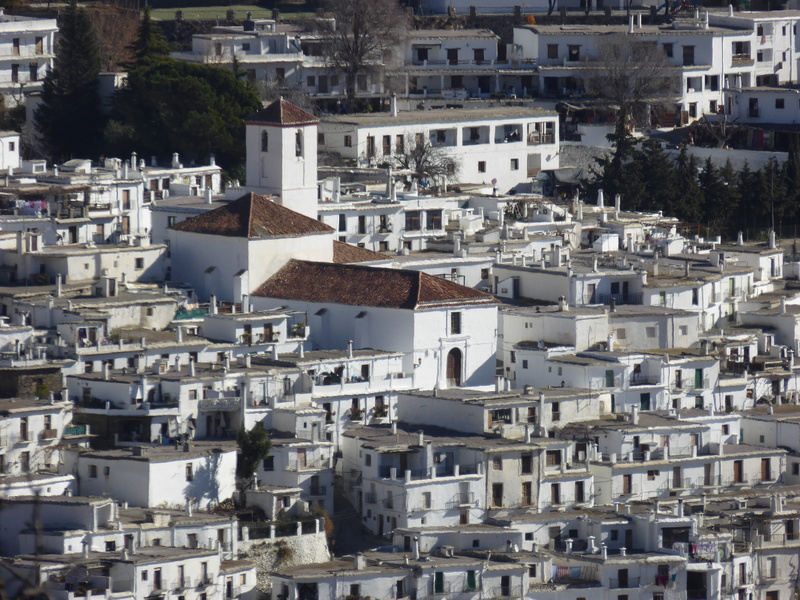 When Anya and I went to the south of Spain to go walking, we chose to base ourselves in a town called Capileira. It was small – population 500 – and therefore easy to get out of (no sprawling suburbs etc). It was situated in hills but it backed on to the main Sierra Nevada mountain range. 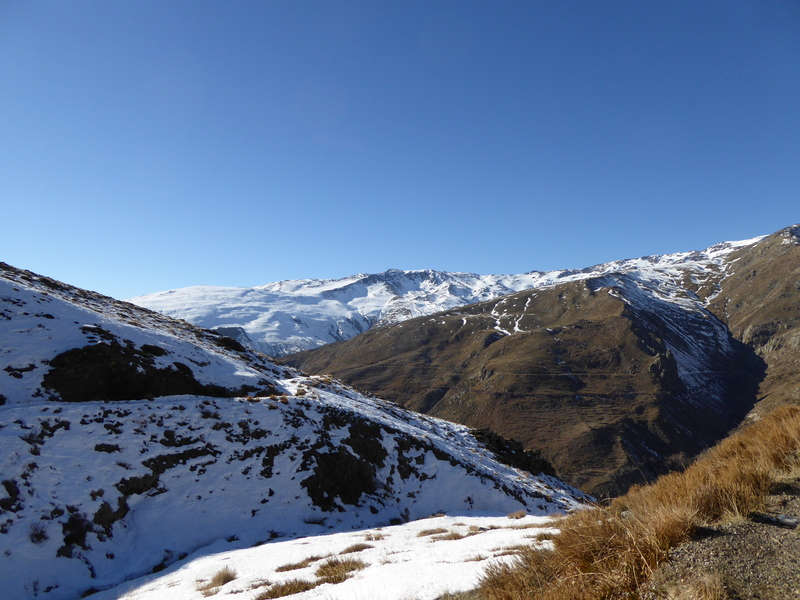 We didn’t know much about the place besides that it was popular with Spanish trekkers, that it had accommodation (we had found other villages in the area for example which looked ideal, but there was nowhere to stay) and most importantly, marked trails. It took us two days to get to Capileira by bus. We were surprised by what we found. There was a tight-knit mass of white houses, dominated by a tall church tower, perched on a long, steep, mountain side. Being winter, the surrounding fields were brown and the trees leafless, whilst the mountains directly to the north were covered in snow. 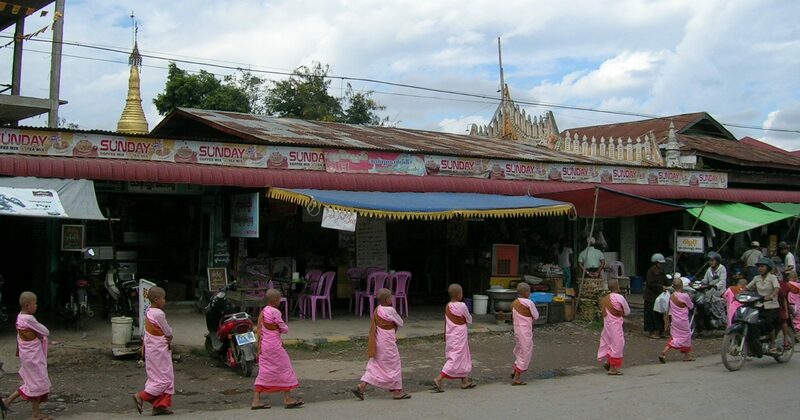 The town reminded us of the Buddhist villages we had seen whilst trekking in the Indian Himalaya. On our second day there, we followed a trail which ascended a steep mountain side at the top of which was a trekkers’ hut called ‘Refugio de Poqueira’ or ‘Refugio’ for short. 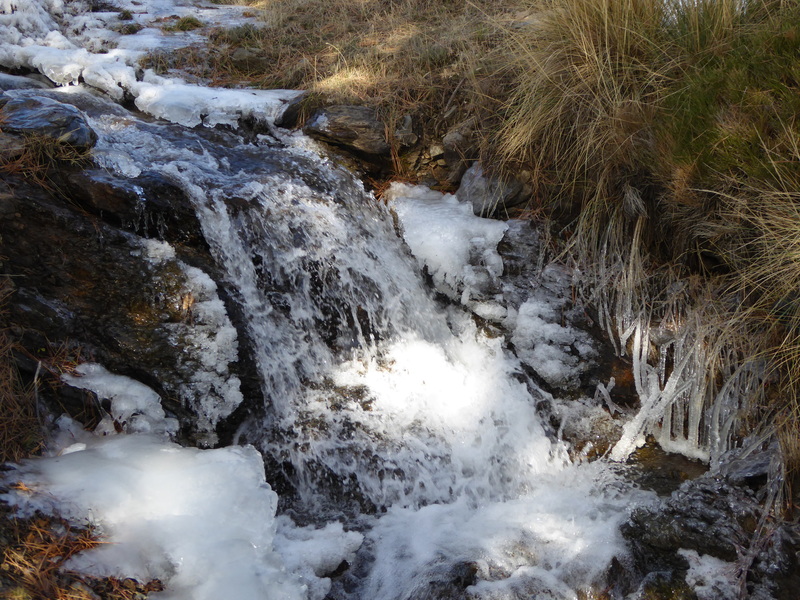 About 1000 metres below Refugio, was a stop called ‘Cortijo de las Tomas’ or just ‘Tomas’. We didn’t reach Tomas until about 3pm – we’d left that morning at 10am – and we soon concluded that we didn’t have enough time to do the climb to Refugio and be back at Capileira before dark. Despite its romantic sounding name, Tomas was abandoned shepherd’s hut. There was nothing there besides a few signs. Looking up the steep, snow -laden side of the mountain towards Refugio, we saw a group descending. It reached a certain point not far above Tomas and then levelled off and commenced walking in a horizontal line across the mountain slope. They moved quickly. There was something there, a road maybe, which we hadn’t seen because of the snow. .
We ascended to where we had seen the group level off: it wasn’t a road: it was an irrigation ditch, filled with ice and snow. It was a relatively simple matter to walk on the ice or on top of the side of the ditch. 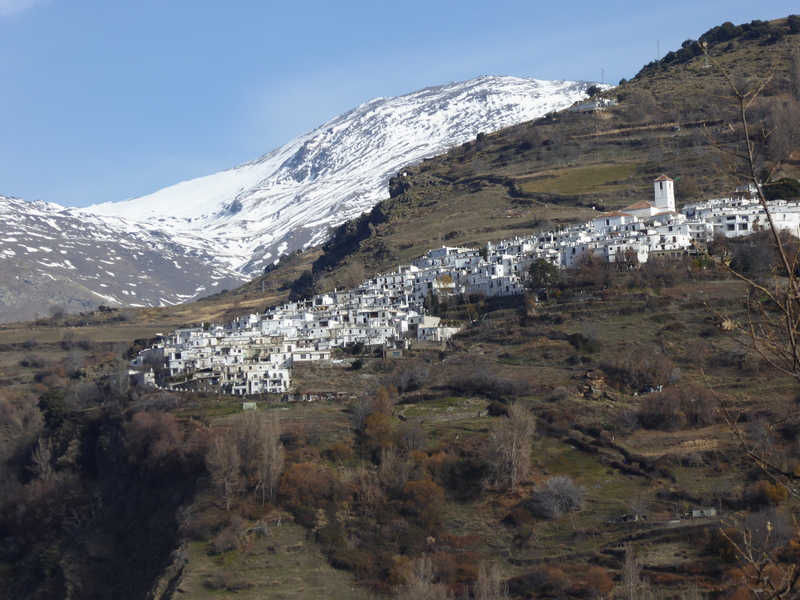 It cut across several successive mountain sides and ended near the top of a mountain peak directly behind Capileira. Whilst following the irrigation ditch, we were overtaken by a Spanish trekker, a man in his 50’s, who spoke good English. We stopped and the three of us began chatting. He’d lived in the area for 30 years and knew the mountains like the back of his hand. He was intrigued that he hadn’t seen us earlier in the day. Most trekkers it appeared reached Tomas following the irrigation ditch. Apparently we had taken the longest and most tiring way possible to reach Tomas. We discussed the weather and how warm it was. Unseasonably warm, he said; it was early January and 20 degrees Celsius. Unheard of up here in the Sierra Nevada. There had been only one major snow fall, he told us, which had been two weeks earlier. But had brought a tragedy with it. On the day it began snowing, two Austrians had got caught in it. One had died and the other been badly injured. ‘Every year people die up there.’ He added, ‘but this was real bad luck’. I was interested in the fate of the Austrians and asked a bit more about them. During the following days, as we followed trails elsewhere in the area, I found myself thinking about those Austrians. Perhaps it had something to do with the fact that only 7 months before, Anya and I had had a close call whilst hiking in Austria. The memory of that incident was still fresh in my mind. We left early in the morning from the bed and breakfast where we staying and started out on a trip which was supposed to take about 5 hours. There was a walk through the outskirts of the small village (certainly no bigger than Capileira) followed by a marked trail which gradually ascended through forest and then went up a mountain side to the top (3 000 meters, the same altitude as Refugio) and then descended back into the forest. The weather was patchy, with intermittent clouds and bursts of bright sun. The walk through the forest took several hours. As the trail neared the mountains, we passed a trekkers’ hut, followed by a sign post indicating various colour-coded directions. Shortly afterwards, we turned on to the trail we wanted to follow (yellow). The trail began to climb steeply upwards through sparse pines growing in between boulders. On our right was a deep ravine. On the opposite side of the ravine were lower mountain ranges clothed in forest. Some of the ranges were enveloped in dark cloud and others basked in bright sun. We came to a point where the trees ended and we were confronted by a steep slope of bare rock. The markings for the trail – rocks here and there painted yellow – were quite obvious. We followed the yellow painted rocks and found ourselves clambering up a series of rock faces, one after the other, sometimes requiring us to climb up sections using our hands as well as our legs. An hour into the climb, a cloud bank moved in, rapidly restricting our visibility. We didn’t know how far we were from the top. What we did know was that once we got to the top, it was a rapid descent afterwards. The trail went up and then straight down. It did not stay high. All we had to do was get to the top; after that, the rest was easy. The cloud got thicker, darker. A wind blew up. Snowflakes flew through the air like bullets. Should we continue or go back? It sounded plausible. Yet: we were on a steep slope. There were some sections we could walk up but others we had to climb up on all fours. The visibility was rapidly declining. My inclination was to turn back, to get down out this maelstrom of wind, snow and mist. We continued but it was at a snail’s pace. Visibility fell to around 15 meters. I didn’t like it. I could feel the fear, the misgivings, rising within me. The trail kept ascending. It didn’t level off. How far were we from the top, dammit? How much further to go? The wind brought steadily more snow. The temperature began to drop. What if the snow got heavier? We could not survive a night caught up here. It was that simple. Then came the sound of thunder: explosive ear-splitting bursts resonating up and down the valley. What was the best course of action? When the lightning came, my mind was made up: turn back. Anya was against it. She argued that we must be near the top. In the end, she gave up. On the descent the wind blew hard, sometimes gusting so hard I was worried we would blown off the mountain side. The trail was difficult to find. The rocks, including the ones marking the trail, were covered by snow. Often we clambered down in the wrong direction and had to retrace our steps. It was a slow, slow, process. We seemed to go nowhere. We helped each down each section of cliff face we came to. The light began to fade. Where had the hours gone? At 3 pm we were still enshrouded by wind, mist and snow. I knew that in these conditions it would be dark by 5. Then we were finished. Every sense, every ounce of energy, was concentrated on one thing: survival. And then came the break: at 4.30 pm we reached an altitude where the snow turned to rain. The cloud thinned out. The visibility increased to perhaps 30-40 meters. We sensed it now: we were going to survive this. By 5pm the first trees became visible. It was lighter. Darkness wouldn’t descend until at least 6. We had at least an hour to find our way down through the forest. It was hard work. We were exhausted. Everything was wet and the rain was heavy. We were drenched, cold, tired. We kept on slipping on the stones and the roots of the trees. At 7.30 that night we appeared back at our bed and breakfast. The owners had been worried and thought about contacting the police. Not that they would have been able to do anything until the following day – by which time we would have been dead. It was absurd what followed afterwards: the hot shower, the dry clothes, the warm meal, and the glasses of wine. That night I found it impossible to sleep. I was on a high. My whole being resonated to a feeling of elation, of triumph: I was alive. We were alive. You couldn’t reduce a life to anything simpler: to be alive! After the high, came the low. Drugs, even natural ones, have their shadow side. Go on a bender and there’s always going to be hangover afterwards. On the following day we caught the train north and crossed the border into the Czech Republic. In the past we had been there many times to go walking. We had always enjoyed it. Often we walked from one town to the next with all our belongings in our rucksacks and booked accommodation as we went – or slept outside. This time however I was pursued by a feeling of anti-climax, of incipient boredom. It was as if a part of me yearned for the experience of being on the cliff face of life and death again. Safe green hills and pleasant medieval towns were no compensation. It took me some time to pull out of this cold turkey. Yes, it was easy for me to visualise the scene of four people standing at Tomas, clouds moving in over the peaks, debating whether to continue – or turn back. It’s the kind of decision which everyone who ventures into high climes will confront sooner or later. A wrong decision can have fatal consequences. Often it is well-nigh impossible to take everything into account. There are so many unforseen and unpredictable factors involved. 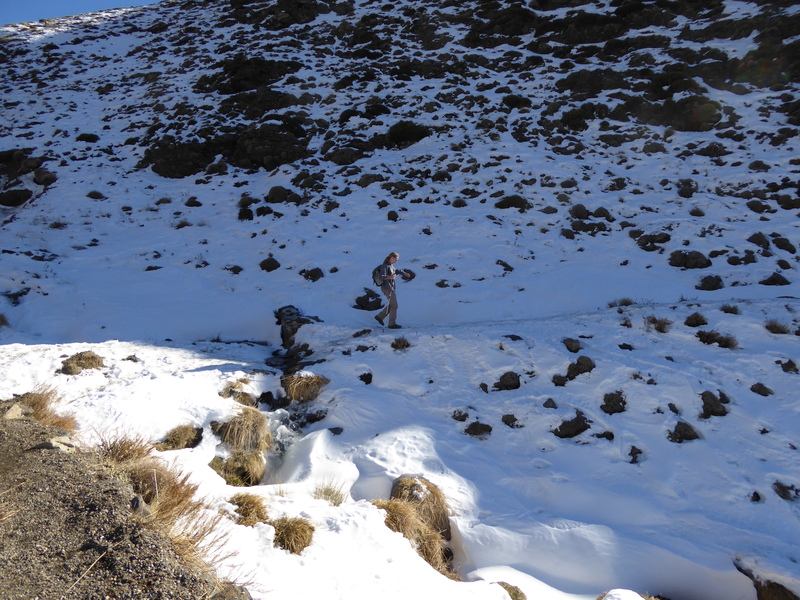 The Austrian couple had almost made it to the trekkers’ hut. Had the storm not been quite so savage, they would have. Yet in the final analysis, they made the wrong decision and paid the ultimate price for it. But then, what was the right decision? Never venture above the low altitudes? Never take risks? Play safe? I thought a lot about that. I thought a lot about fear. Fear was an indispensable part of experiencing the full intensity of being alive. Could we always live strictly in accordance with ‘common sense’? What kind of life was that?